The letter is written in purple ink, which grows faint every few lines from the pen’s drying. The lines are very straight, but tilt ever so slightly upward from left to right. The letters are spaced quite widely. It is difficult to distinguish Monet’s periods from his commas; he begins only new paragraphs with capital letters, and new sentences start with lowercase letters. Sometimes his spellings are unconventional (e.g., “quand à” for “quant à”), and he often omits accents on words (replicated here). Je n’ai pu vous écrire hier j’étais à Argenteuil près de mon pauvre ami Caillebotte dont vous avez du appendre la mort si soudaine, et que j’ai tenu à voir une dernière fois. c’était un ami comme on en rencontre rarement, et sa fin me cause un bien grand chagrin. il a été si bon pour nous pendant nos durs moments. Connaissez-vous Guillaumin, lui a vecu longtemps dans la plus etroite amitié avec Cézanne Voyez le quand même c’est un excellent garçon qui j’en suis certain vous fournir [sic] tous les details que vous desirez et qui aussi sera heureux de le voir mettre en evidence. mais voyez aussi Renoir. quand à voir ses oeuvres, elles sont bien disseminées. beaucoup ont du se perdre. Zola doit en avoir dans un grenier Mr. Choquet avait les plus beaux et en grand nombre, mais comment voir cela, je ne sais. personne n’a pu penetrer chez Mme. Choquet depuis la mort de son mari, mais comme ils avaient l’un et l’autre un veritable culte pour Cezanne, peut-être seriez vous accueilli volontiers en ecrivant ce que vous voulez faire. cela vaudrait la peine de tenter une demarche y vous pourriez vous autoriser de moi au besoin si vous le jugez à propos. quand à l’adresse vous la trouverez chez Dubourg, le doreur. de Bellio et Caillebotte en avaient aussi et vous pourriez je crois les voir facilement. Je viendrai à Paris lundi pour l’enterrement de notre ami peut-être vous y verrai-je mais je dois revenir le soir même. mais comme ma femme viendra aussi il se peut pour la moins fatigue [corrected from typescript] que nous arrivions demain soir à terminus soit vers 10 hr ou pour diner. je vous la télegraphierai à la justice. dans ce cas nous pourrions nous voir si vous êtes libre ou vous pourriez diner avec nous. je ne me tire pas de mes Cathedrales et suis très decouragé j’hesite à m’exposer. I couldn’t write to you yesterday I was in Argenteuil next to my poor friend Caillebotte, whose sudden death you must have learned about, and whom I was keen to see one last time. he was the kind of friend you rarely meet, and his death causes me a very great sorrow. he was so good to us during our hard times. Do you know Guillaumin, he lived for a long time in the tightest friendship with Cézanne Look at him all the same. he’s an excellent boy who I am certain will give you all the details you want and who will also be happy to see him set in the limelight. but see Renoir too. as for seeing his works, they are quite widely scattered. A lot of them must have been lost. Zola must have some in an attic. M[onsieu]r Choquet had the most beautiful ones, and a lot of them, but I don’t know how to go about seeing them. no one could get past Madame Choquet’s door after the death of her husband, but since they both had a veritable cult for Cézanne, maybe you would be welcomed willingly if you wrote what you want to do. It would be worth the trouble to try a step [deletion] you could take me as your endorsement if you need to, if you think it’s called for. As for the address, you’ll find it with Dubourg, the gilder. De Bellio and Caillebotte had it too, and I think you could see them easily. I’ll be coming to Paris on Monday for the burial of our friend maybe I’ll see you there but I have to come back the same night. but since my wife will be coming too it’s possible, in order to tire ourselves out as little as possible, that we’ll arrive tomorrow night at the end of the line, either around 10 o’clock or for dinner. I’ll send it to you by telegram at La Justice. In that case we could see each other if you’re free or you could have dinner with us. I’m not pulling myself away from my Cathedrals and am very discouraged I hesitate to expose myself. 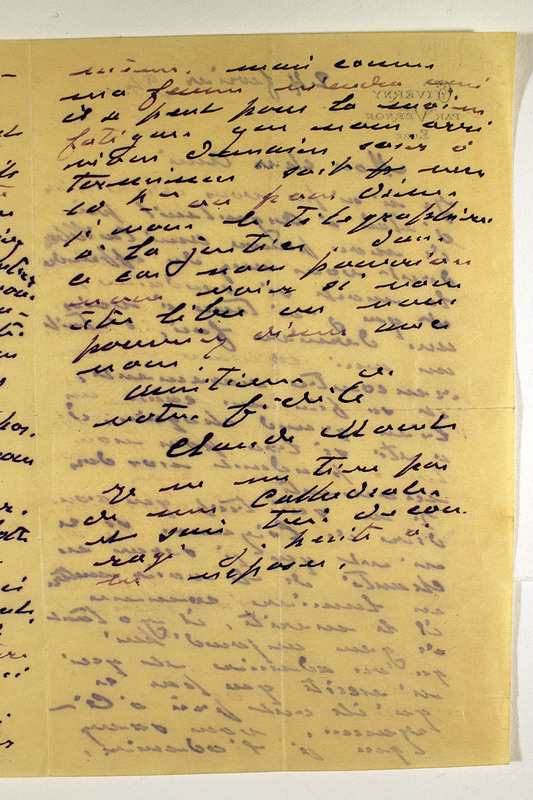 We cannot know for certain who received this long, chatty letter from Claude Monet: he addresses it only to “My dear friend,” and there is no envelope. (It is unclear whether this letter has been previously collected and published.) One strong candidate is Gustave Geffroy, a friend of Monet’s who was the art critic at the magazine La Justice. 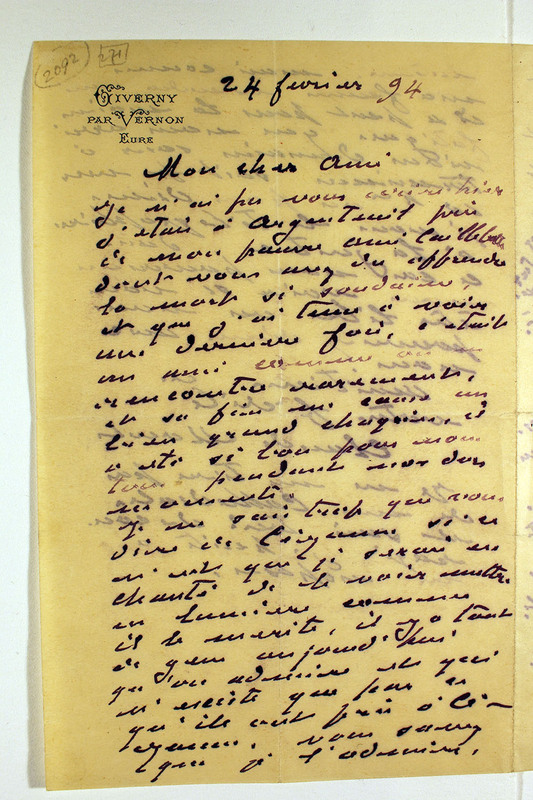 Not long after the date of this letter, on March 25, 1894, Geffroy published an article praising Cézanne, then still comparatively little-known, calling him “Cézanne fantomatique.” Whoever the correspondent was, he or she must have written to Monet to inquire about Cézanne, occasioning this reply. Monet had first moved to Giverny, the famous estate where he would spend the rest of his life, in 1883; he purchased it outright in 1890, after his finances improved dramatically in the middle of the decade. But while he was proud that the home was finally his (as the Giverny letterhead shows), he did not paint the garden until 1895, after an extensive series of modifications and improvements to the garden. 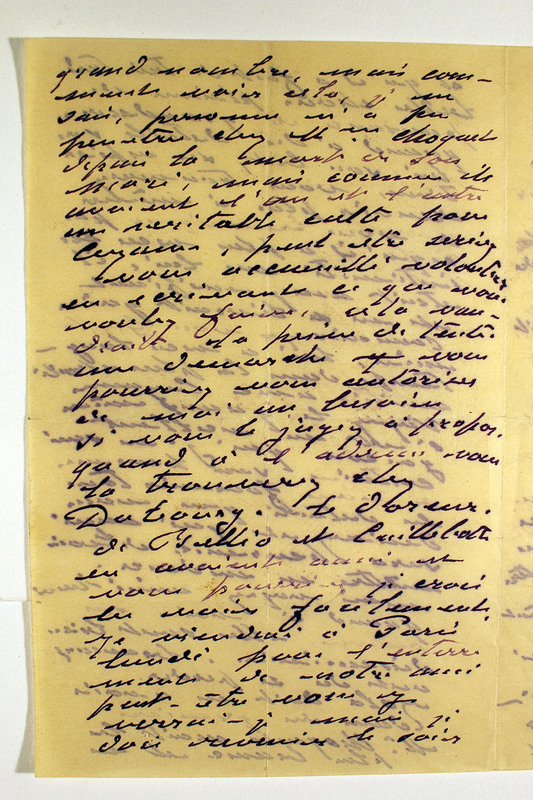 In 1893, a year prior to this letter, Monet had begun negotiating with local government to build a water-lily pond by diverting water from the Eure; in 1894, he placed his first order for the plants from the Latour-Marliac nursery. Monet’s stepson Jean-Pierre Hoschedé pointed out in his memoirs that it was Caillebotte who had first introduced Monet to his lifelong love of gardening, starting at Argenteuil; the gardens at Giverny and the paintings produced there might never have existed otherwise. Caillebotte died suddenly at the age of forty-five, on February 21, 1894; Monet, shocked by the death, must mean here that he went to see the body on the 23rd. At this point in their lives, Monet knew Cézanne very little, as he remarks here. That would change by the end of the year: Mary Cassatt visited Giverny in November and brought Cézanne along with her. 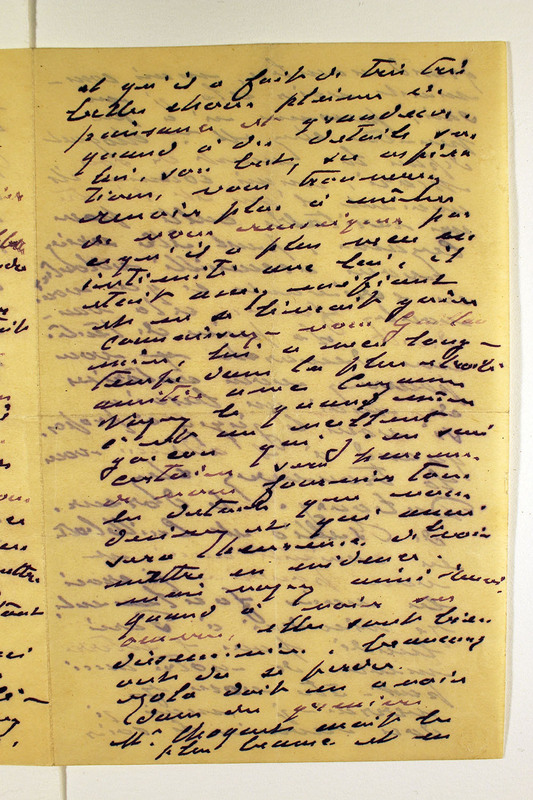 The letter is full of references to other figures in the circle of the Impressionists, as well. Armand Guillaumin was also a painter around Monet’s age; he had known Cézanne for over three decades. Victor Choquet (sometimes “Chocquet”) was a friend of Cézanne and Pierre-Auguste Renoir and sat for both painters; like Caillebotte, he had bought works by many of the Impressionists in order to support them at the moment of their greatest financial need. He had died in 1891. The novelist Émile Zola had been a close friend of Cézanne since childhood, but they stopped speaking in 1888 after Zola based a character on Cézanne; nevertheless, as Monet surmises, Zola owned a number of his paintings until his death. Georges de Bellio was a Romanian doctor who was a close friend of Monet. The cathedrals that Monet refers to at the end of his letter are the famous series of paintings of Rouen Cathedral as seen from exactly the same perspective at different times of day and year. He had painted most of the canvases over the course of the previous two years and by winter 1894 was working on them in his studio at home.